NASHVILLE, TN (March 20, 2018) -- Urban Green Lab, in partnership with Nissan North America, the Country Music Hall of Fame & Museum, and Piedmont Natural Gas, today announced a new educational initiative that brings Nashville businesses together year-round to make environmental sustainability a priority in the workplace. 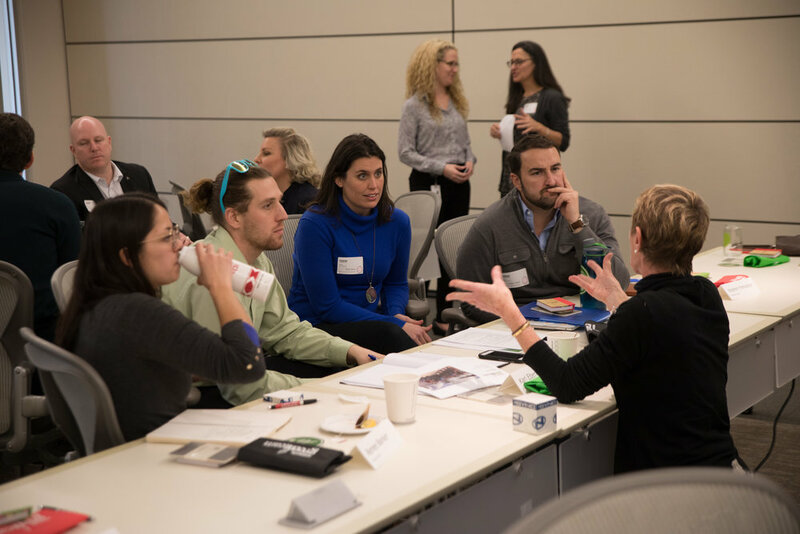 The new Corporate Sustainability Roundtable is designed to encourage sustainable workplace behaviors and policies through the development of corporate "green teams" -- teams of passionate volunteer staff within companies who spearhead sustainability initiatives, like recycling and energy conservation, for their businesses. Citywide, corporations are joining the Roundtable to learn, network, foster new skills and strategies, and exchange best practices around systemically reducing waste in their offices. Through a series of bi-monthly meetings and small group exercises, tours and presentations by rotating member companies, interaction with resident experts, and aligning waste diversion measures, members collectively explore how to minimize their environmental footprint at a time of economic boom for the city. “Corporate education is vital” says Todd Lawrence, a Nashville native and executive director of Urban Green Lab, a nonprofit that teaches communities how to live sustainable, healthy lives. Urban Green Lab works to ensure everybody knows the basics of sustainable living, with a focus on urban lifestyle choices and eliminating waste -- like food, energy, and water waste -- in classrooms, households, and workplaces. “The dedication of these businesses is impressive," says Lawrence. "With more people moving to cities like Nashville worldwide, there’s never been a more important time to work and live sustainably. The Roundtable makes sure we’re holding each other accountable and marching forward together." Kroger, Comcast, CMT, DHL, DaVita, the Nashville Renaissance Hotel, and the Music City Center, among others, have also joined the effort since its start in January, blending well-established green teams with newly-established teams just getting their foothold. In addition to a special recognition program and membership-wide challenges, Urban Green Lab is also creating educational curricula and tools for green team organization that help companies assess their workplace needs and formulate action plans. The Roundtable determines its effectiveness by measuring green team growth and impact, employee educational outreach, and shared waste diversion outcomes. Earlier this month, as a part of $6 million in new grants to promote recycling statewide, the Tennessee Department of Environment & Conservation awarded Urban Green Lab $30,000 to create a special recycling curriculum and signage through the Corporate Sustainability Roundtable that helps green teams advance recycling education among their colleagues. The grant will result in an annual Sustainable Workplace Report which will be shared with State, Metro, and other officials, offering a snapshot into how corporations tackle the issue of sustainability within their own walls. "The grant is a big win for all of us and will provide the momentum we need to keep this ball rolling,” says Laura Cook, who currently facilitates and helped build the Roundtable on behalf of Urban Green Lab. The Corporate Sustainability Roundtable comes at a crossroads for the city. More businesses and residents are moving to the area than ever before, with some 1.8 million people and 40,000 businesses now calling the Nashville region home, according to the Nashville Chamber of Commerce. The Nashville Business Journal notes that just six of those companies, including HCA and Tractor Supply Co., account for $100 billion in annual revenue, and since many of Nashville’s companies are either national or global, encouraging sustainable office culture can have a ripple effect far and wide. Sustainability experts are also concerned about the toll rapid growth may take on the region’s natural resources and waste management infrastructure, especially as local landfills fill to capacity. According to a new waste stream and recycling characterization study by Metro Nashville Public Works and the Tennessee Department of Environment & Conservation, some 70 percent of all waste in Davidson County (organics, plastics, paper, metal, and glass) from non-residential sources like corporations could have been recycled, rescued and reused, or composted before ever reaching a landfill. In Urban Green Lab's preliminary polling of the Roundtable's members, companies show a need for immediate and collective action. While most feel they work for environmentally-responsible businesses where staff would support efforts like recycling, only 40 percent have active green teams that tackle sustainable workplace practices. Only half of the companies regularly report on sustainability metrics, such as how much energy they use or conserve in a year, and just 30 percent have specified short-term and long-term sustainability goals. Very few routinely educate employees about the topic. "Most companies really want to achieve that triple bottom line of people, profit, and planet," says Lawrence. "It often just takes one employee to spark institutional change." The next Corporate Sustainability Roundtable meeting is May 10th at Piedmont Natural Gas. To join the Roundtable or learn more, contact Todd Lawrence, executive director of Urban Green Lab, at [email protected] or visit www.urbangreenlab.org. Urban Green Lab is hiring for a Corporate Sustainability Manager to help lead the Roundtable. Click here for details.